Spectacular Villa with breath-taking views over the ocean,the entire Funchal bay and the mountains. location is great 15 minuts by car to the airport and 8 minuts to city FUNCHAL. and walking distance 4 minuts to bus stop. 10 minutes to Palheiro Golf. espresso machine and coffee Lavazza. John born in Madeira ,leaved in San DIEGO now share time in MADEIRA. to enjoy the quiet ,peaceful Island . The contemporary villa location is superb located in cul-de -sac ,quiet , just two houses and magnificent view. very confortable and praticice inside with opens space. the house you don't want to leave, enjoy your cup of cofee ,a glass of wine or dinner with a beautiful sunset.Enjoy your stay! felt in love with the lot ,.this unique location made me built my dream house where our family had enjoyed many good times and fews NEW YEAR'S FIREWORKS .This is one of the best spots in the city for this celebration you have acess to the entire house ,private garage and garden. 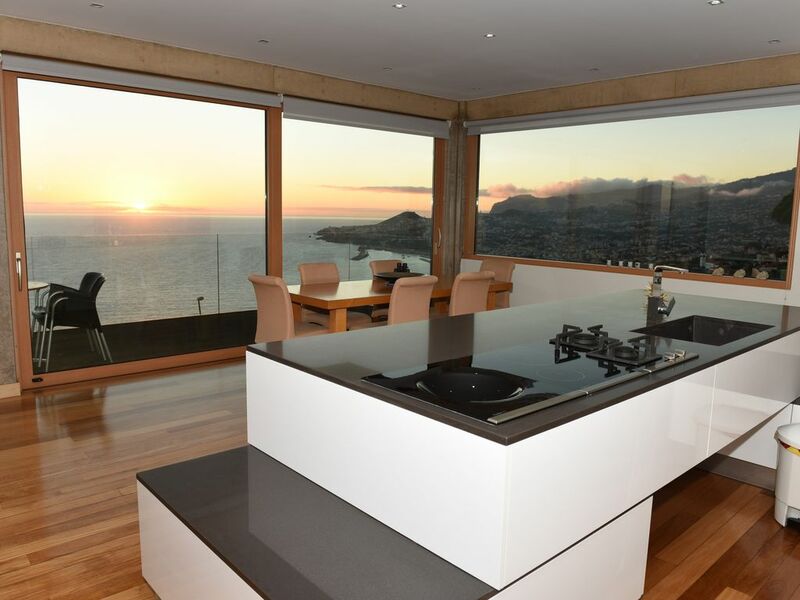 The home sits high above the city of Funchal. It offers beautiful views of the Atlantic and the city, morning, noon and night. We had coffee every morning on the deck. It is a bit far from the city without a car. If you have a car be prepared for the steep driveway and winding roads. The house itself is very well built and supplied with everything you need. I will say that the common area furnishings are a bit tired. Jaoa was a welcoming host. We arrived very late and he waited for us and also had bread, bananas and water for us. We were enchanted with the island of Madeira. We did look forward to arriving back to the house after a busy day of touring. The property had spectacular views and was great that you could open up all the doors for the fresh air to flow though the property. I loved sitting out on the balcony with a glass of wine and a good book. The bedroom and bathroom were one room, the toilet had a separate room. The only downside was walking down the drive to get a taxi/bus this was very steep. If you rent a car the drive is very steep and it takes a bit of steering to turn the car around, but is manageable. Taxi fares were reasonable it cost us 10 euros into old part of Funchal.